The neighborhood north of Massachusetts Avenue (NoMa) has recently transformed into a thriving social hub and residential destination for young professionals. 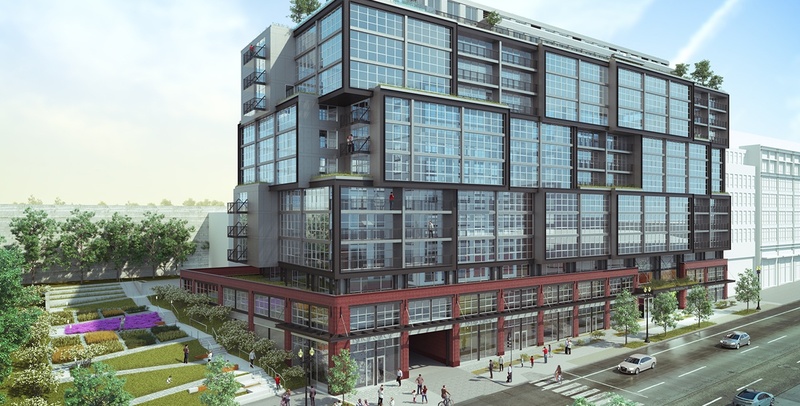 The Highline at Union Market, a new, mixed-use residential property located at 320 Florida Avenue, preserves the industrial aesthetic of the surrounding area, by incorporating warehouse-style windows, steel columns, and stacked, industrial-framed glass blocks into the unique, building design. The transit oriented property will include: 313 new residential units, a green roof; a bioretention facility to retain storm water and lessen the impact on the site’s storm water infrastructure; variable refrigerant ﬂow (VRF) for heating and cooling; dedicated outdoor air systems (DOAS); solar hot water heating panels to provide domestic hot water for building occupants; and 105 bicycle parking spaces for residents and employees.